Beetroot seems to be an ingredient which keeps popping up in a lot of baking recipes recently; and no wonder. 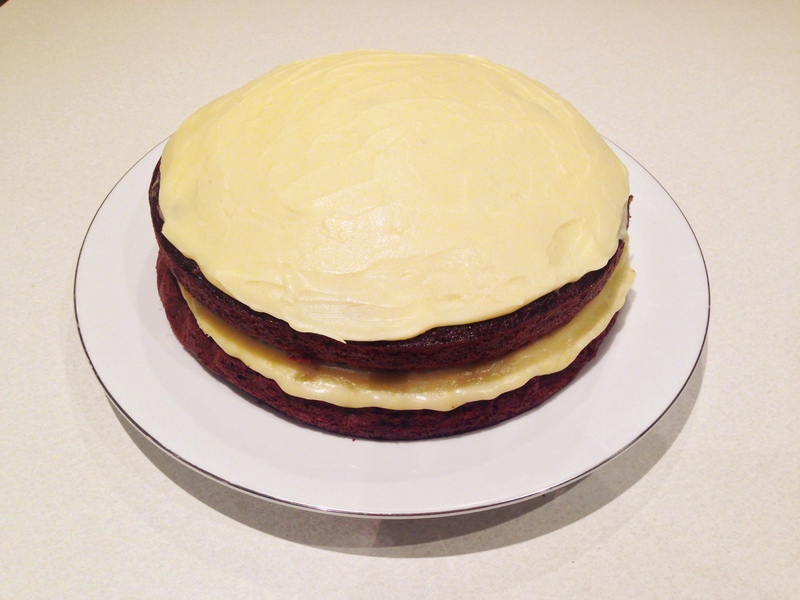 Beetroot increases the amounts of nutrients in your cake, so you feel less guilty about the big dollops of icing. It produces a beautiful red colour and also makes things moist (everyones favourite M word). 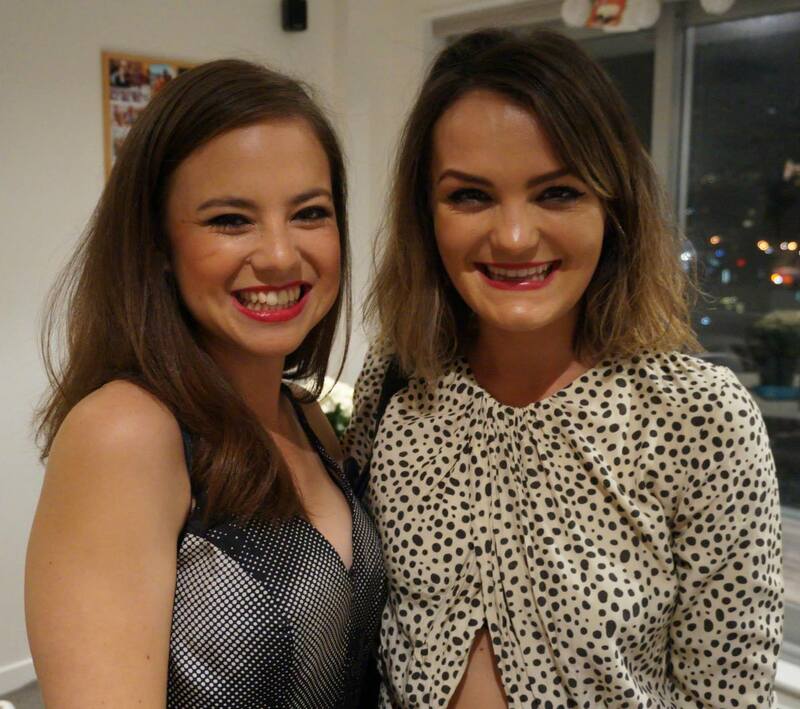 It was time to bake a cake as it was my friend Zoe’s birthday. Zoe also shares a passion for sweet treats that have a healthy spin, so I thought this would be a good cake to try. 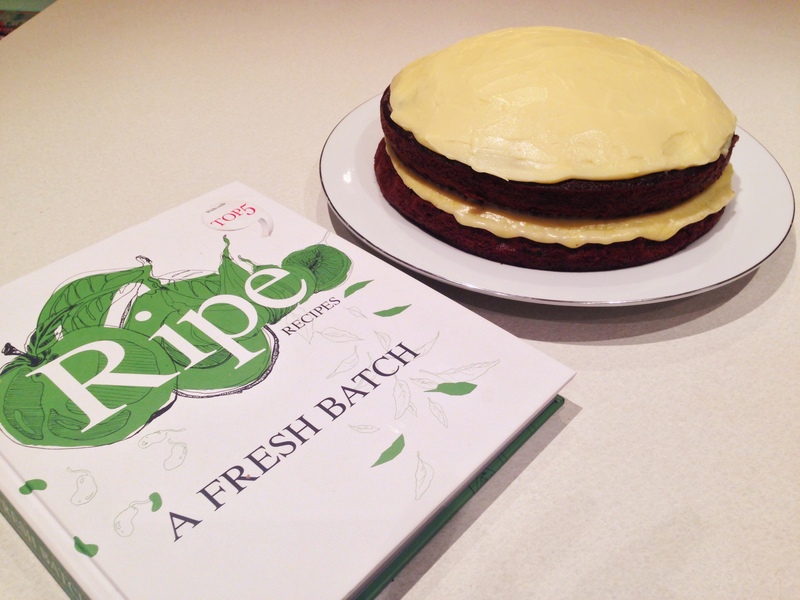 This is the second cake I have attempted from the Ripe Cookbook. The first cake (chocolate and candied hazelnut cake) was a crowd pleaser, so I had high hopes for this one! This cake was served to a group of guys and girls after an italian feast at Piccolo. When I was asked by the guys what type of cake it was I tried to whisper the name. I did not want them to think this cake was going to be part of the latest health craze of #cleaneating and #raw food. However, everyone really enjoyed it. There were comments that it tasted similar to a carrot cake in the way that there was cinnamon, spices and cream cheese icing. The cake was really easy to make, however it was quite time consuming – but what cake isn’t! I would definitely make it again. Grease and line two 23cm cake tins with baking paper. 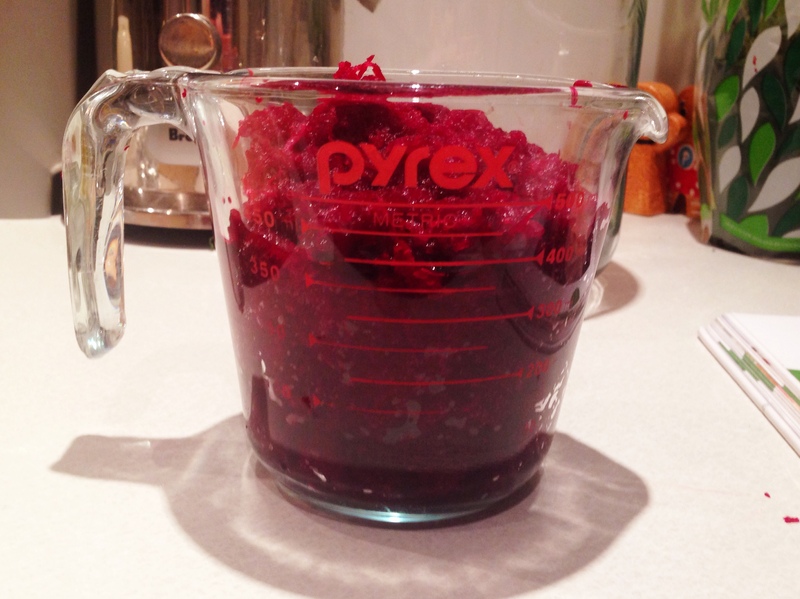 Note: once the beetroot is peeled and grated you want to end up with approximately two cups of grated beetroot. In a food processor bowl, place the grated beetroot. Lemon juice and vinegar. Blend to a very fine puree. This will take approximately 5 minutes. Transfer into a small bowl and set aside. 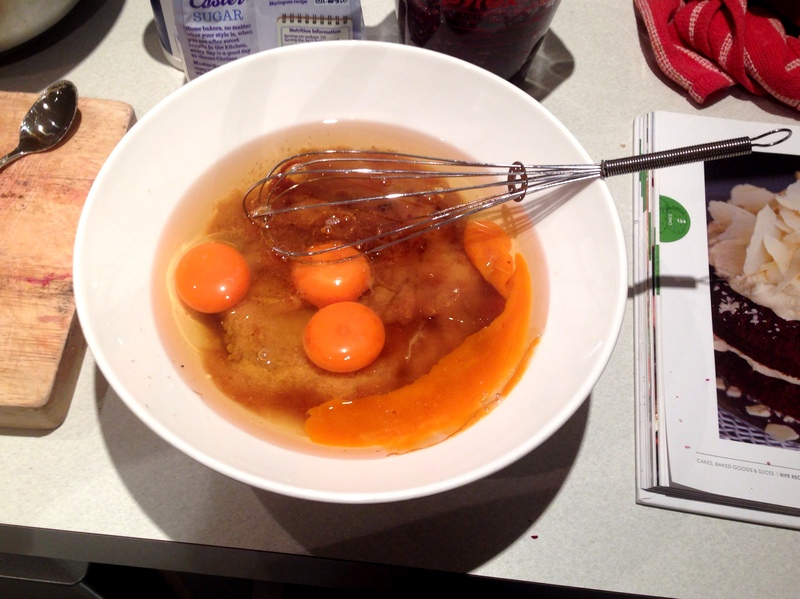 In a medium-sized bowl, place brown sugar, caster sugar, eggs, oil and vanilla. 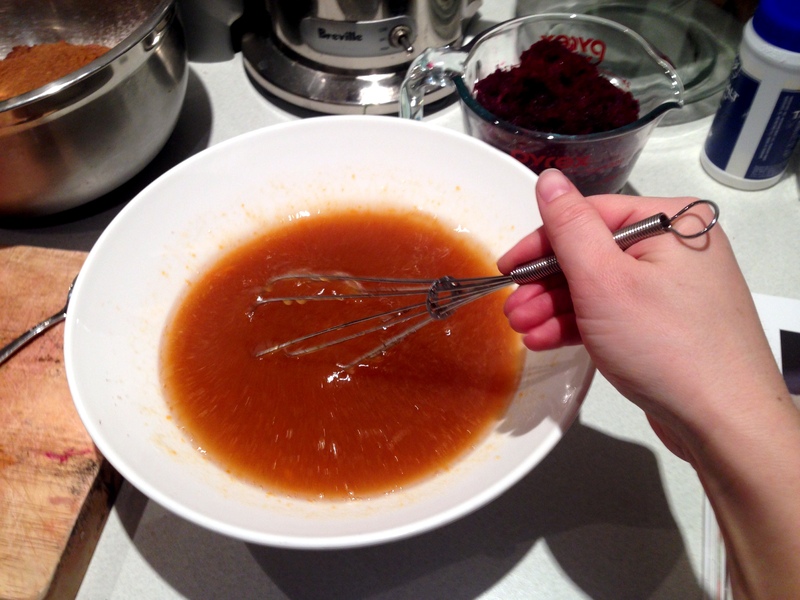 Whisk together until thick and glossy. 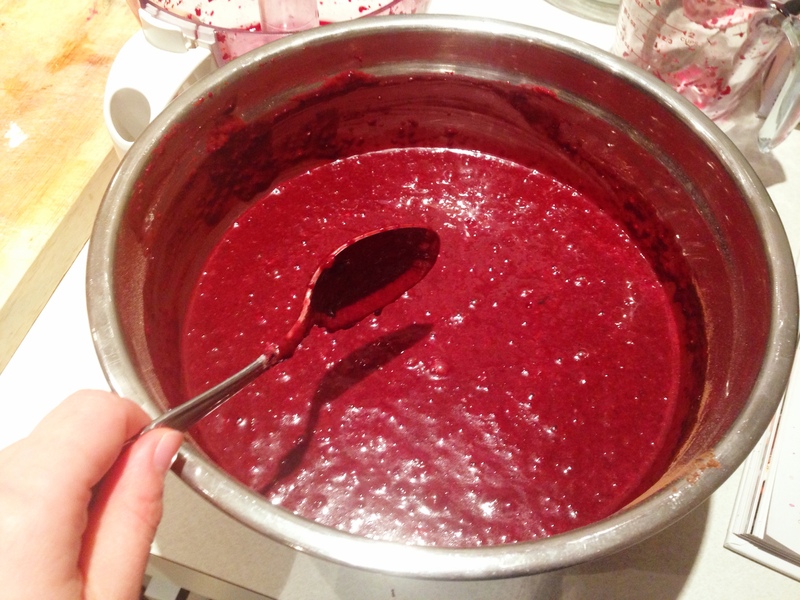 Make a well in the middle of the flour and pour in the wine; add the egg mixture and the beetroot puree. Mix together until just combined. Do not over-mix the batter. Divide the cake batter evenly between the two tins. Bake for 30-40 minutes or until a skewer inserted into the centre comes out clean. Remove from the oven and leave in the tins to cool a little before turning them out onto a wire rack. To prepare the icing: Place a heatproof bowl over a saucepan of simmering water. Melt the white chocolate, butter and cream together. Whisk with fork until well combined. Place the cream cheese in a cake mixer bowl and beat until soft and fluffy. Slowly pour in the white chocolate mixture. Beat until light and creamy, scraping down the inside of the bowl so that the cream cheese is well combined and there are no lumps. Add the icing sugar and beat for another minute or two. Cover with cling film and place in the refrigerator for 10 minutes to firm up. When the cakes have cooled, spread half the icing onto one of the cakes. Place the second cake on top. Be careful that your top cake does not slide off the bottom cake! This happened to me, so I used skewers to keep it in place until it decided it did not want to move anymore. Spread over the remaining icing and garnish with curls, shards or shavings of white chocolate. I omitted this step asI had ran out of chocolate. Transfer onto a cake plate and serve.